Last week we looked at the odd 21st century phenomenon of politicians shaking hands with robots as if they were human. 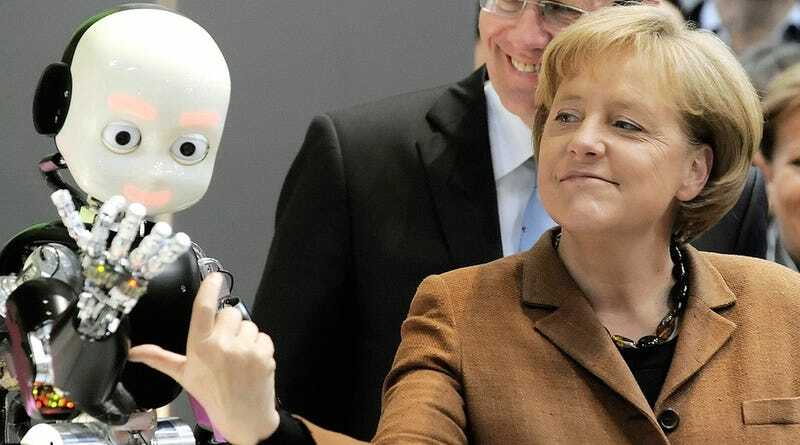 We learned a lot about the potential robot uprising, but we also discovered that one politician in particular always seems to be hanging out with robots: German Chancellor Angela Merkel. There is perhaps no other world leader who has posed for photos with more robots than Angela Merkel. She pats them awkwardly, she accepts gifts from them, and she’s constantly shaking their hands. But why is Merkel always palling around with robots, the known enemies of the human race? Does she know something we don’t? It can’t be that she loves them so much — in most photos she appears incredibly uncomfortable around her robot friends. So what’s the real story here? If you know anything about the impending robot uprising or why Angela Merkel might be hanging out with so many robots, please drop us a line. Anonymity cannot be guarantee on account of the robots having penetrated all our systems. Sure, you could interpret those last couple of photos as a robot arm innocently handing Merkel an apple. Or you could see it for what it really is: The robot Devil tempting a world leader in the new Garden of Eden with forbidden fruit. More Like Justin Trudeau-bot, Right?